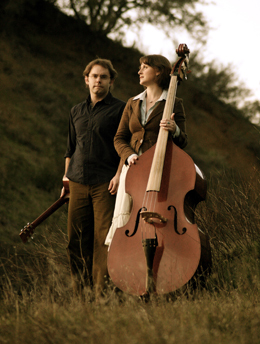 Sam plays guitar, Megan plays mandolin and upright bass, and their blended voices ring with commitment and vitality. Influenced by folk music and Motown, blues and bluegrass, the pair achieves a sound that is both traditional and contemporary. As actors as well as musicians, they understand the art of embodying a story and the importance of connecting with the audience. Hicks with Sticks has called Misner & Smith “a Bay Area treasure to be shared . . . with a touch for taking simple ideas and infusing them with unexpected meaning, metaphor, and imagery.” So come out and share the treasure—this is a performance to savor.